Cape Royale is a security guard-gated community in Coldspring, Texas situated in San Jacinto County. Homebuyers who are looking to purchase a house in proximity to everyday conveniences can find what they are looking for in Cape Royale, Texas. With grocery stores, shopping and dining, schools, and medical facilities within seven to thirty miles away from home, residents feel near enough with the peace of mind that their community is private and quiet. Developed by George Mitchell in 1968, Cape Royale has been updates and today sees recreational spaces like a community pool, park, tennis courts, basketball courts, boat ramps and slips, a marina, and the Cape Royale Golf Course. 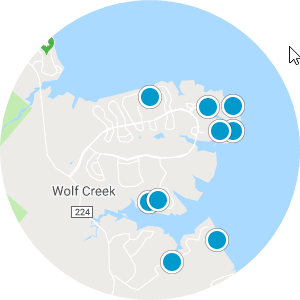 An exercise room, clubhouse, and Cape Royale Boating Association welcome homebuyers looking for properties for sale in Cape Royale. Setting in the woods on the southwest shore of Lake Livingston, this 90,000-acre community is home to around 1,700 lots, maintained by a Property Owner’s Association. Open layouts and floor plans with as many as three and four bedrooms with 1,000-3,000 square feet of living space are discoverable in the homes for sale in Cape Royale. Secluded houses, shaded by towering trees elevate the feeling of privacy in Cape Royale, Texas, and unbeatable views of Lake Livingston help create the aura of paradise. Waterfront homes for sale in Cape Royale are some of the most sought-after properties in the area. If you are interested in purchasing Cape Royale real estate in Texas, please contact us today. Agents please present your Real Estate License at the gate for entrance.